On the picture above you can see two economy made knives from Victorinox with what i call a signal color on the handle scales. These two may look the same but they are very different compared to each other. This color is very different from the usual economy made knives we see from after 1975 but it reappears later. These two knives does not have any markings that should make these Migros knives. The left one got the tang stamp 1973-1975 and the emblem does have a very special construction. It is different. The hot stamp used 1979-1994 does have many different variations but this left one does not fit any of them. I believe the left knife is 1973-1975 made. The corkscrew is also very slim and it is fragile. I do not have the number on the left knife but it got the standard or Spartan configuration. The right one got the same functions + key ring and the number is 3.36.01 This knife got the 1980 stamp and it is a knife from 1980-1985 because of many factors. Backside stamp on the right knife! The flat screwdrivers does not have the scraper function and one should expect the left knife from 1973-1975 to have that on. I can see that the way it is shaped that it is from that production it is just the scraper that is not put on. It is different with the economy made knives and the scraper is usually not on. I have collected many hot stamp emblems from the late 1970s until 1994 with this shape. The left one is different. I would believe it to reappear later. The signal color did reappear because the knife from 1980-1985 got this and i believe they are different in material. On the right you can see them compared to the normal red found on them from the late 1970s until 1994 with some small variations. There are different levels on economy made knives and the scraper tool may be on some knives in the 1970s on them. I reccommend reading my page on St.Christopher. On the picture below you can see the left emblem compared to other hot stamped variants. Only the knife on the far right is pad print. So far on all my knives i have not found any hot stamp emblem of the type used from the late 1970s until 1994 that can compare to the left one above. It may look similar on a picture and the silver color is worn off at some places. There are some special small differences on it that makes it distinct. I have many 91mm economy made knives and the size of the type used from the late 70s until 1994 got variations both production variations and other. I have a selection of 84mm economy made knives as well. The Elinox category started in 1957. 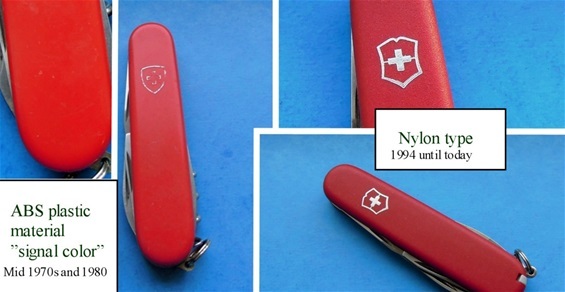 Victorinox does mention in their information that until 1969 only cheap foreign knives was sold in Swiss souvenir shops. 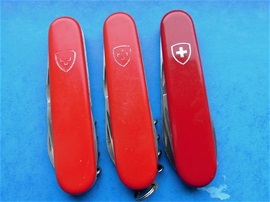 After a court ruling the foreign knives with Swiss emblem could be forced to a stop. Victorinox says we created the Elinox for this reason. One must not forget that the economy made Elinox knives dates back until 1957. 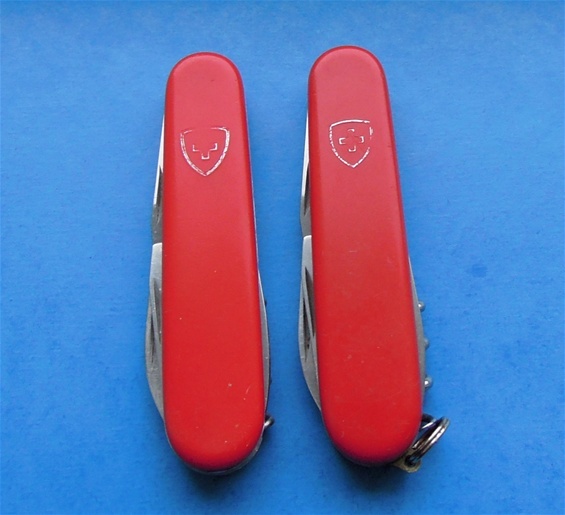 The cheap foreign knives used a Swiss emblem. They are very different and not like the economy knives i collect. 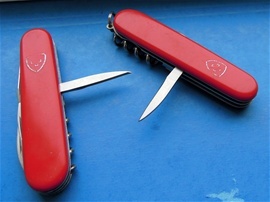 The Elinox economy made knives from 1957 and up until the changes in the early 70s had or did use a inlay emblem usually. The knife on the left at the top of this article is the economy made knife that got the lowest quality, after this time window the quality got better and better. The St.Christopher Elinox during 1957-early 70s got a better quality than during the 1973-1975 time. Even so they are extra collectable. The 1973-1975 time window was not the best economy made era. Not by my feel anyway. One importortant factor is that some dating tools on a SAK can make difficulties. The tang stamp, tools and emblems are valuable help. I do suspect one factor on Victorinox regular and economy made knives. I believe Victorinox at some time periods produce some blades and parts i such numbers that it can reappear later on. Not any of the knives in this article should be affected by this but it may happen. I do believe the 1973-1975 tang stamp may reappear or i have seen knives that could make this plausible. I have cross checked all i know to be able to make this article. In general it should be ok! One must also not forget that knives could at some time have been repaired by Victorinox. Advertising knives could have been on storage and many other factors happening as well. On the picture below you can see a picture i made with information on the economy made knives with special handle material. On the left is the signal color type and right is the nylon type. It is very interesting for me and i will explain why. Information on the internet and other sources say the signal color handle material is ABS plastic and i do believe this to be correct. It is difficult to picture the correct shade on them. It is close to a signal color i believe and this red/orange is not the most beautiful and the precision is not the best made. The advantage is the more tough material and the impact strenght. The usual material used on the economy made knives got a more beautiful color and it looks more correct but maybe not the strongest made. It behaves close to the cellidor material and maybe it is. Let me know because there are different names used out there. The ABS seems to have taken abuse well and taken the tests of time. The precision on the economy knives with the usual material are very well made from the late 70s but the ABS is not. The material used from 1994 is Nylon type and this is a perfect material on this line. They are precision made, tough and durable. In many ways on a user knife it is much better. Not as beautiful looking but a perfect user material. What is extra interesting is the use of different materials on this line by Victorinox! I would like to talk some more about the two knives on the top. The two signal colored SAKs got different corkscrews. The left one is from the mid 1970s and the right knife is 1980-1985 and i am closer to 1980 in fact. The left one got the slim/thin corkscrew made of a material that is not the best and it is sad to be fragile. Mine is in good order. 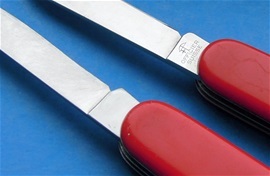 This is the type used in the mid-1970s by Victorinox. The right one got an exaggerated opening inside the loops. During the mid 1970s until 1980 there are 3 different main constructions on the corkscrew. On the 1976-1980 knives you can find the much better corkscrew. There are variations. The mid-1970s type got a different tint on the metal as well. What i can say is that the corkscrew 1979 until 1985 may have some variations in diameter but so much.